Britain’s Brexit secretary David Davis has reportedly ruled out a transitional deal for the UK after leaving the European Union. The Financial Times reports that he told a meeting of city financiers last month that he “wasn’t really interested” in that sort of arrangement. Alex Barker is the Brussels bureau chief of the Financial Times. Almost 19,000 children were admitted to hospital for self-harm in 2015-16, according to new figures. Dr Virginia Davies is chair of the Child and Family Public Engagement Board at The Royal College of Psychiatrists. Boris Johnson begins a tour of the Gulf states this morning starting in Bahrain and moving on to Saudi Arabia this weekend. Sir Malcolm Rifkind is former foreign secretary. Government forces have retaken 75% of east Aleppo in recent weeks, areas that rebels had controlled for four years. Reports suggest while fighting appears to have eased, there is no sign it has completely stopped. Lyse Doucet is the BBC's chief international correspondent. A group of food industry leaders have called on the government to take action over Brexit. They ask the government to reassure EU workers in the food industry about their right to remain here. One signatory of the open letter is the Association of Licensed Multiple Retailers which represents 90% of managed pubs and branded restaurants. Kate Nicholls is its chief executive. British business will regret its reluctance to invest in research and development according to the vice-chancellor of Oxford University Professor Louise Richardson. The University has announced a huge increase in funds for turning ideas into successful companies. Simon Jack reports and Carolyn Fairbairn is CBI director-general. The former astronaut John Glenn, the first American to orbit the earth, has died. He was ninety-five. Nicholas Patrick is a former astronaut who knew John Glenn. The amount of money councils in England generated from parking charges and fines rose by more than £60 million in the past year according to a new study. Councillor Peter Fleming is deputy-chairman at the Local Government Association. Steve Gooding is director of the RAC Foundation. Public schools are to offer up to 10,000 free places to lower income families, providing the government pays them what it would cost to educate the children in the state system. 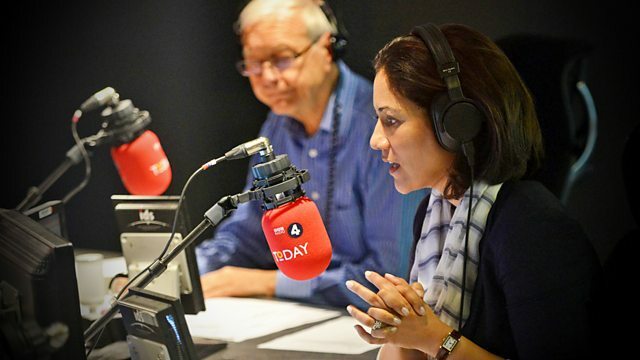 The BBC’s political correspondent Ross Hawkins reports, Barnaby Lenon is chairman of the Independent Schools Council and Estelle Morris is former Labour education secretary. The final episode of Planet Earth II 'Cities' airs this weekend (Sunday night, BBC 1, 8pm). The BBC natural history series is set to become the second most-watched TV programme of the year, after The Great British Bake Off. Mike Gunton is the executive producer of Planet Earth II and Fredi Devas is the producer of this Sunday’s final episode. Haseeb Hameed became the youngest debutant to open for England in a Test match when he played against India at Rajkot in November. He gives a rare interview with the Today programme. It's less than 50 years since the last major racial segregation laws in the US were struck down in the Supreme Court case of Loving v Virginia. The plaintiffs were Richard and Mildred Loving, a white man and black woman, who were convicted for marrying in their home state of Virginia. Jeff Nichols is director of ‘Loving’ which comes out early next year. One in four children in the world now lives in conflict or disaster stricken countries according to UNICEF. Mike Penrose is executive director of UNICEF. Launching his American speaking tour in Indiana last night David Cameron claimed it was “populism” that cost him his job. Simon Jenkins is a Guardian columnist and Joan Smith is a writer and human rights campaigner.